We are witnessing awe-inspiring advances in the history of healthcare. Scientists, researchers, physicians, biopharmaceutical giants, brilliant entrepreneurs and innovative startups alike are creating and launching digital health solutions that amaze the mind. There is clearly no shortage of fuel for this trend gaining momentum as most evidenced in recent publications from Startup Health indicating the slope of the curve for investments in digital health is still very positive, recording a record in Q3 2017 at ~$2.5 billion. We also witness daily examples of the powerful IT used by most other industries such as Retail, Transportation, Hospitality, Financial Services, etc. Amazon and others harness real-time mathematical patterns in all business interactions to influence, if not modify, the behaviors of suppliers, partners, and consumers. Imagine what may be possible for a clinical practitioner in a clinical episode? Then why, one may ask, does this not happen with dependable regularity given the availability of tools and fuel – not to mention outspoken “cries” for actionable information by clinical practitioners? It seems like today’s healthcare businesses still rely on decades-old data infrastructures and IT architectures that yield capabilities entrenched in archaic modes of intuition-based care and static evidence base. 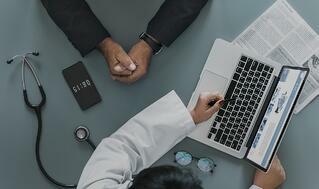 We submit the problem is: the business of healthcare is broken, and that’s getting in the way of forward-thinking clinicians who should be optimizing these digitally enabled medical advancements in the execution of what they’ve been trained to do. Consumers are frustrated because they have limited access to high-quality, high-value care. Clinicians are frustrated because these broken business models prevent them from delivering high quality care. No one is winning. Couple this observation with reports of financial losses mounting at notable institutions such as MD Anderson, Cleveland Clinic, Catholic Health Initiatives, etc. and these fundamental challenges plague rapid advancement of operating models that translate digital solutions into capabilities that influence clinical outcomes, patient behaviors – and business operating efficiencies. Careful analysis of targeted and empirical research has revealed a pattern of consistency with regard to distinct elements of successful business model reinventions from enduring and leading brands and corporate enterprises outside of healthcare. Several hundred companies were examined highlighting those successful with operating abilities to transcend shifting industry dynamics, establish/execute visionary strategies, and or continuously transform/reinvent themselves. We have isolated these patterns into a set of enterprise capabilities consistently deployed in various manifestations/configurations for successful transitions from current to new business operating models. A pivotal and seemingly foremost capability these organizations rely on is information management - the enterprise capability to manage and act on data in collective, coherent, streams of contextualized in-the-moment and actionable knowledge leading up to an event or outcome. 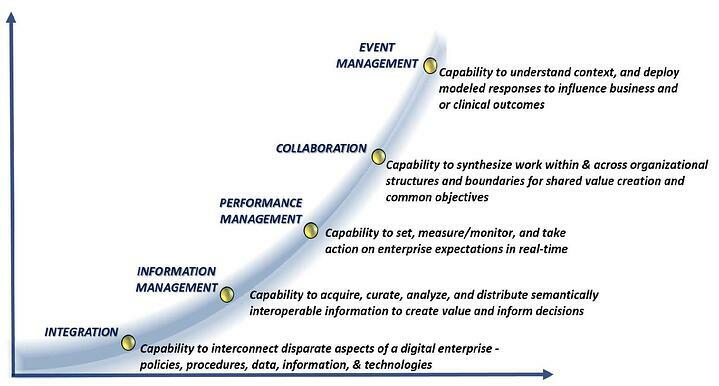 All other differentiating capabilities are dependent on information management abilities – therefore one may safely deduce the only way to begin total reinvention of today’s healthcare-dominant business design is to modernize IT infrastructure and rapidly establish competencies around managing data as information/knowledge assets for operating efficiencies and greatly improved clinical outcomes. This all starts with data integration at the atomic level leading up to friction-free semantic ontology (commonly referred as "interoperability"). This is somewhat simply accomplished via proven and modernized architectural stack(s) of enterprise infrastructure that channel commonalities such as transport, connectivity, vocabularies, business meaning, security, and global policy management. These fundamental IT disciplines have consistently performed as the core of enterprise reinventions for Fortune 100’s as well as forward-thinking/advanced healthcare enterprises. The simple fact is that implementing an event-enabled, services oriented, semantically interoperable data graph/layer as a business reinvention backbone is indeed a winning formula and one we suggest will break the code when it comes to reinventing healthcare. To further exemplify the fundamental and absolute roles of integration and information management please see the illustration above depicting a maturity curve for consideration of interrelationships between enterprise reinvention capabilities. Although not linear nor sequential, dependencies between the capabilities are critical to accretive relationships. For example, without integration fundamentals, expecting to become mature in Information Management is not a reasonable expectation, and so on. We suggest building all enabling capabilities simultaneously in planned frequencies of architected sprints that include business process assimilation and tangible value elements in your business investment portfolio and plans. To learn more about one of many use cases, download our Digital Patient Health Solution Sheet.